A company’s corporate social responsibility (CSR) program says a lot about its business values. In today’s business world, companies are judged not just by the quality of products and services they offer but how willing they are to invest in the communities they call home, and how engaged both their workforce is in demonstrating those values. And as one international corporation has discovered, corporate leadership engagement is often critical to ensuring a vibrant and successful CSR strategy. Alexander Mann Solutions, which was founded by Rosaleen Blair in 1996, is considered a global leader in talent acquisition and management. Today, it’s also known as a company that demonstrates CSR values by showcasing its own – clear to the top of its corporate leadership. “[At] Alexander Mann Solutions we are very lucky to have a very integrated corporate social responsibility program, which supports and aligns perfectly with our business strategy of growth and delighting clients,” said Tim Campbell, who serves as Alexander Mann Solution’s client service manager of Emerging Talent and Global Citizenship. According to Campbell, it’s the company’s focus on senior management involvement that makes its CSR program click. That, and the CEO, whose own people skills and CSR focus help set the standard for community involvement. “I think we are lucky here at Alexander Mann Solutions where we have a very engaged C-suite board who all understand and support [the importance of our] corporate social responsibility program. And having a charismatic chief executive who has always been so impassioned about supporting people,” said Campbell, is part of what drives the success of that leadership. Campbell said he feels the company’s own objectives, to “match talent with opportunity” offered a dynamic opportunity for a successful CSR program that essentially offers very similar goals and relies on company-wide participation. “[When] we were thinking about engaging our business with a corporate social responsibility program, the first point obviously was to make sure our leaders, our senior management were brought in because they are the ones that are going to spread it throughout our company,” said Campbell. Outside programs like the UN Global Compact, which encourages and mentors sustainable business practices, became a guidepost for the company as it developed its tailor-made CSR program. For Alexander Mann Solutions, Campbell said, the secret to company-wide engagement when it came to community volunteering was encouraging autonomy. 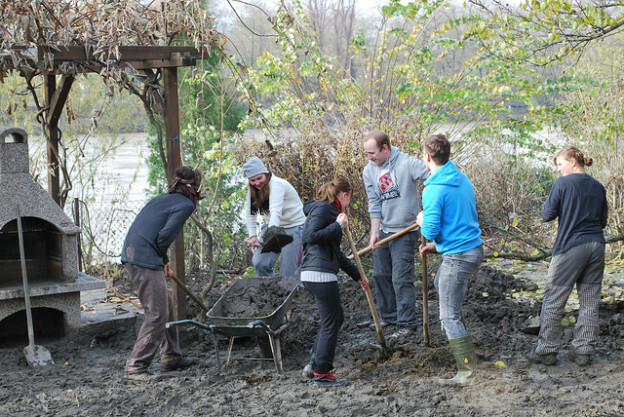 Employees, including senior management, are given one paid day a year to volunteer in their community. But it’s up to them to decide the best value for that day. “Most organizations will encourage their employees to go and do some work with a registered charity,” explained Campbell. “It’s easy to monitor [and] they can see the return in investment. At Alexander Mann Solutions, however, employees are given the option to volunteer where and however they choose. “[You] don’t have to go and support a registered charity, because you might actually have a neighbor who needs [help] shopping, or you might actually have a school that needs somebody to do some reading for an afternoon,” said Campbell, who added that by instilling trust in its workers, the company is actually delivering a teachable moment about its four work values: to be distinctive, to be passionate to retain authenticity and to be brave. The system works, said Campbell, because it takes individuality into account, recognizing that employee situations are often as diverse as their interests. Some workers in Cleveland, for example, work remotely and live remotely. Encouraging them to use their talents in their own community as they prefer keeps employees engaged. It provides an internal communications network where employees (and their managers) can post information about new volunteer projects (one employee raised money for cancer patients with a bike ride and posting the news on the company’s internal communications site). For Campbell, discovering the incentives that motivate and keep people engaged in good values comes naturally. He is also the founder of the UK nonprofit Bright Ideas Trust, which helps individuals from underserved and disadvantaged communities develop their own entrepreneurial aspirations. In 2014 he was presented with the honors of MBE (Member of the Most Excellent Order of the British Empire) for his contributions to the enterprise culture. Campbell acknowledged that not all businesses are fortunate enough to have a senior management team that has from the start, had the talents and skill sets to build a CSR community. For small companies and those still trying to figure out how to build their own program, he had one key piece of advice: Remember there are many companies that have learned how to leverage the hidden skills of senior leaders and incorporate them into a budding CSR program. Companies like Unilever and Allianz (an insurance company based in Australia with global partners) have found ways to jump-start their own CSR programs by seeking out the skill sets of their senior managers and building a portfolio of leadership opportunities. “[They] have taken clear guidance around supporting projects where their skills will invite you to the initiatives that they support,” said Campbell. Driving that growth is both the desire of consumers to see more corporate engagement at all levels of the companies they support, and the determination of young talent to join companies that are willing to align their business values with their community commitments. “I think what organizations are clearly finding now is that employees, or potential employees are demanding much more of their employers before they decide to join.” And that yearning from prospective employees can actually have value for companies that want to build a dynamic CSR program and know their new hires (and management-in-training) will help lead the way. For Alexander Mann Solutions, said Campbell, instituting a solid program that builds engagement with its communities starts with instilling trust in its employees – from the top down.